64 Shots: Leadership in a Crazy World is a compendium of value-accelerators for business and life. It is gathered as a 64 shot method from the astute observations and remarkable life of creative business leader and iconoclast Kevin Roberts. A provocative figure traversing the peaks of global commerce, media and sport, Kevin Roberts - creator of the groundbreaking idea Lovemarks - is recognized as one of today's most uncompromisingly-positive and inspirational leaders. 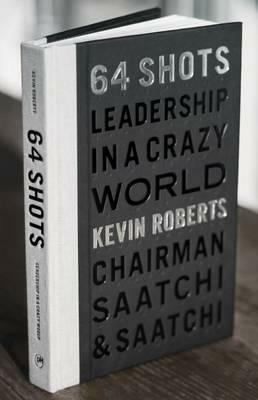 In 64 Shots, Roberts draws on the biggest ideas, toughest experiences and greatest influences of his life to present 16X4 stripped down, straight-forward and instantly-absorbable insights on how to bring order to the chaos of business and life. The punchy insights into winning - hitting readers lightly jab after jab - are an array of one-liners, sound bites, tweets, charts, quotes and historical reference points. They are loaded with Roberts' experience, story, brio, provocation and direction. The language is extreme, brimming with the irrepressible attitude and provocation that fueled Roberts' meteoric career. While there is a sequence, the 64 shots are stand-alone signposts towards living an enterprising and winning life. Anyone can dip into the book anywhere and find value. The writing is accompanied by (not necessarily linked to) a visual order of black-and-white photos of leaders in their cultural fields, some modern, many historical, some famous, and all personal. This eclectic selection of people are both direct and indirect influences to Kevin Roberts' life. They all have an interesting - and some mysterious - connection to concepts of leadership in a crazy world. Examples are: Mary Quant, Vince Lombardi, Margaret Thatcher, Vivienne Westwood, Twiggy, Tom Peters, Peter Drucker, Martin Luther King, Renzo Rosso, Brigit Bardot, Bob Dylan, Sean Fitzpatrick (a rugby player). The book is high touch and glossy. It feels like Apple, not Shakespeare. 64 Shots - will you take them? "We get 50 books a day at Bloomberg, every day, all year, and 64 Shots is far and away the most gorgeous and beautiful book to have walked in the door in years. 64 Shots is my book of the summer." "Kevin Roberts does, well, a Kevin Roberts hat trick. 64 Shots is pure Roberts magic--practical as hell, applicable in the next 15 minutes, a life guide, and pure inspiration in terms of both content and design." "Roberts uses his British/New Zealand heritage to serve up unfiltered, un-PC and unbelievably wise stories that weave in hilarious and momentous encounters with world leaders in politics, sports and business. He draws on all that has informed his thinking to transform ours. It is 64 shots of adrenalin, inspiration, affirmation and a GPS for starting and leading an organization where whatever you planned yesterday is likely to be toppled over by today's events." -Tom Keene, Bloomberg News "Kevin Roberts does, well, a Kevin Roberts hat trick. 64 Shots is pure Roberts magic--practical as hell, applicable in the next 15 minutes, a life guide, and pure inspiration in terms of both content and design." -Tom Peters, Business Maverick "Roberts uses his British/New Zealand heritage to serve up unfiltered, un-PC and unbelievably wise stories that weave in hilarious and momentous encounters with world leaders in politics, sports and business. He draws on all that has informed his thinking to transform ours. It is 64 shots of adrenalin, inspiration, affirmation and a GPS for starting and leading an organization where whatever you planned yesterday is likely to be toppled over by today's events." Kevin Roberts is a creative business leader and iconoclast whose current career roles include Executive Chairman of Saatchi & Saatchi, one of the world's most iconic advertising brands, and Head Coach of Publicis Groupe, the world's third largest communications group. He was previously CEO Worldwide of Saatchi & Saatchi (1997-2014), and has held leadership positions at Gillette, Procter & Gamble and Pepsi-Cola throughout the world. His business books include the groundbreaking Lovemarks: The Future Beyond Brands (powerHouse Books, 2004) published in 18 languages. Kevin Roberts is Honorary Professor of Creative Leadership at Lancaster University, Honorary Professor of Innovation and Creativity at the University of Auckland Business School, and Honorary Professor of Leadership and Innovation at the University of Victoria (B.C.) School of Business. He advises national organizations and global brands across commerce, media and sport. He lives in New York City and Arizona USA, Auckland New Zealand, and Grasmere in England's Lake District. In 2013 he was made Companion of the New Zealand Order of Merit.